The Ring is a multi-channel computerized sound effects system. It consists of a central computer with 16 independent audio outputs connected to 16 speakers that are on the circumference of an 80ft diameter circle and pointed towards the center. Listeners stand in the center of the circle to hear the sounds. The software is still being developed. Some examples of sound effects include: whistling bottle rockets exploding from all around, motorcycles riding around the ring at different speeds, 16 different women having orgasms simultaneously, alien spacecraft sounds, freight trains, rain and thunder storms, animals and jungle sounds, insect sounds. The software also includes a text to speech generator that will occasionally announce things such as the time of day or maybe tell a joke or read poetry or plays. We also hope to include a microphone and allow people to record sounds and have them played back with different effects processing, and then allow later users to recall those sounds and listen to them. The Ring is controlled by a PC (a 550mhz AMD with 64mb Ram and 10gb of IDE disk space with four professional grade 4-channel sound cards (Midiman Delta 44s), running RedHat 6.2 linux with the OSS sound card drivers). The 16 audio ouputs are connected to 8 pairs of speakers (16 total). Each pair of speakers includes one subwoofer which also contains the amplifier for the speakers. The speakers used are Cambridge Soundworks Microworks speakers. Despite the speaker pairing all audio channels are treated as mono. The speakers are mounted on metal fence posts about 3' off the ground (with the subwoofers on the ground). The speakers are arranged on the circumference of an 80ft diameter circle and are pointed towards the center of the circle. The subwoofers will have small blue nightlight bulbs on top of them. The PC is in the center of the circle in a small wooden enclosure to protect it from the elements. It includes a UPS, a monitor and keyboard. A small Honda 1000W generator (EU1000) is placed 100ft from the center of the circle and a burried power cable connects it to the PC. From the PC, eight burried power cables star out to power each amplifier (in the subwoofers). Also eight 2-channel audio cables star out from the PC to each amplifier. 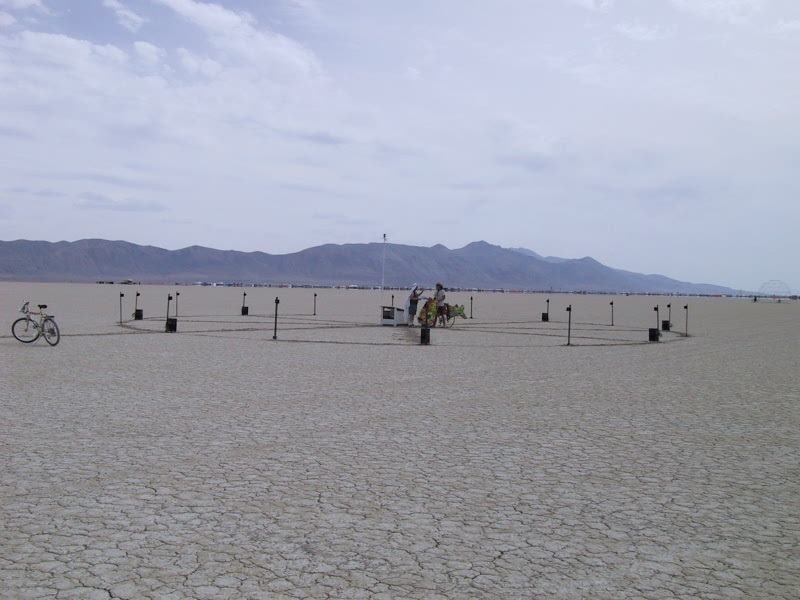 The Ring was on display at Burning Man 2000, at location 11:45 about 6000ft from the center of the man. A new version of the ring will be on display at Burning Man 2001. 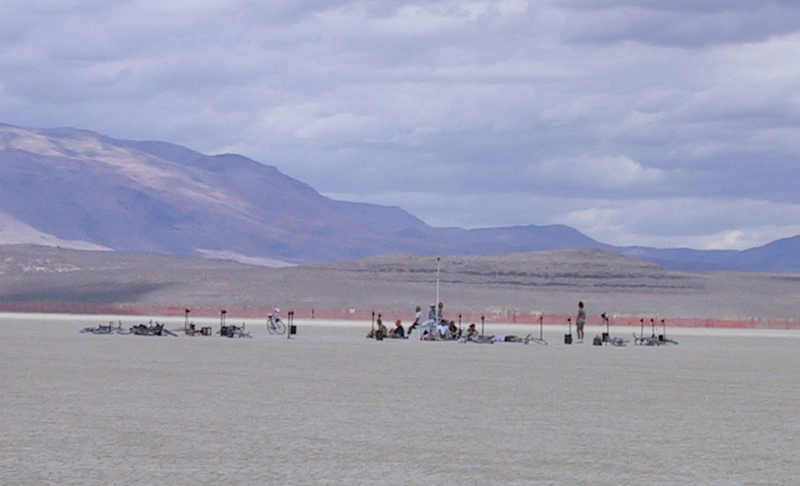 It will be located on the open playa at approximately 11:45 and 2000ft out from The Man. The physical design of the new ring will be different. A PVC pipe will lie on the ground around the circumference of the circle, with PVC pipe 'posts' sticking up from the ring to hold up the speakers. All the wiring will be fed through the PVC pipes. The computer system will be located on the outer edge of the ring, freeing the center for listeners. A faster computer and new sound effects will also be used. A blue strobe light on a pole above the computer will help people locate the ring at night. On top of each speaker will be a candle-shaped light (a yellow LED controlled by a PIC microcontroller). The candles form a network that is controlled by the Linux computer system. The candles will display various lighting effects in coordination with the sound effects.